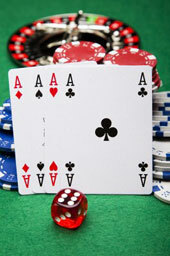 SOUTHWEST CASINOS is a part of Westland Communications, a full service marketing company operating since 1985. It's owner is William Previtti, an advertising, public relations professional since the late 1950s. Each of the casinos featured on the web-site is recommended by Mr. Previtti as to their friendliness, professionalism----you're invited to "check 'em out" as they say. There is no claim of sole authorship on any of the publications offered herein. is covered in each booklet. And these methods of play were developed over decades---that's decades, of play. These longtime gamers shared the same philosophy, their approach to each play …. " …. remain cool, stay with the method and bet with your head, never over it." And one last note of advice: "Quit while you're ahead, but don't quit while you're winning…….."
IT WAS THE ERMA BOMBECK WHO ONCE WROTE ABOUT GUARANTEES …. THERE ARE NO GUARANTEES IN MARRIAGE SAID BOMBECK. YOU WANT A GUARANTEE GO BUY A CAR BATTERY. TO HELP YOU GET TO THE PLUS SIDE OF THE LEDGER. FIND A GAME YOU LIKE, THEN GET REAL GOOD AT IT.